Not all of my holdings reflect my current investment philosophy. Before I knew better, I was a stock picker. 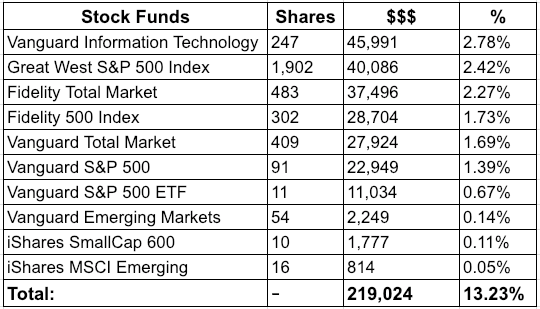 Prior to starting this blog, I didn’t even know what an index fund is! The humanity! Now, almost all new money that goes into the markets goes into index funds. When I play with individual stocks, it’s with very small amounts of money. 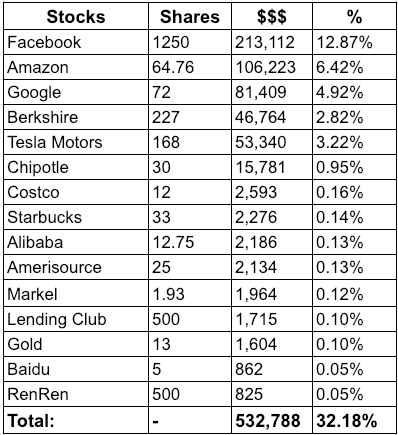 I’m not thrilled that Facebook is my single biggest holding. The company has been in the news a lot lately and for all the wrong reasons. And beyond that, social networks are trendy. There are signs that Facebook is struggling and there will come a day when the network goes the way of MySpace and Friendster. I’m slowly selling my shares. My average purchase price for my facebook shares is $26.53. Not back for a stock that sits at $166 today (2/7/2019). If I had this money invested in the S&P 500, it would have been worth about $60 today with dividend reinvestment. My long-term goal is to sell my portfolio of all individual stocks, but I’m doing it slowly to avoid capital gains. When I put money into the markets now, this is where it goes. I’m a big believer in index funds. Trailer park: We own a trailer park with two other partners. All income to date has been invested back into the park, so we haven’t earned a dollar yet. This will change sometime in 2019. Coworking space: I own part of a building and small business in my hometown of Longmont. Read more here. 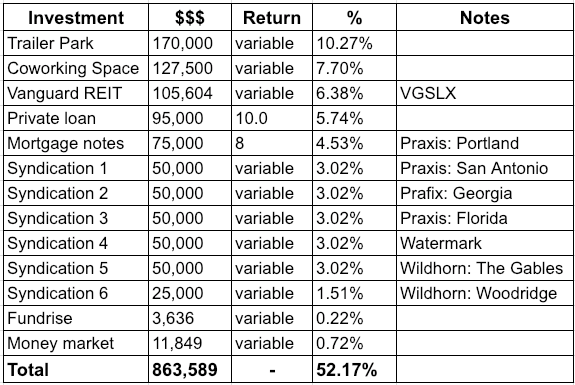 Vanguard REIT: VGSLX isn’t a bad way to invest in real estate passively. Private loan: We occasionally lend money to others to help make their real estate dreams come true. These have all performed exactly as expected. Mortgage notes: We invest in short-term loans which give us a steady 8% return. These have done very well for us. Syndications: A syndication is a deal where you invest in a large property with other investors. All of our syndications are apartment building where the syndicator rehabs units, raises rents and sells 5-8 years later, hopefully for a big profit. We get quarterly payouts and also get a big check (again, hopefully) at the end when the property sells. We have yet to have one resold and these investments are young, so it’s hard to evaluate the success of them now. Most of our real estate holdings are in a self-directed solo-401(k), so we can’t touch the money. This works out well for us since these investments are long-term in nature. We have $40,000 in cash. This is a little less than what I’d want to have going into full retirement, but since Mrs. 1500 still works, I’m OK with it now. Ideally, I would like to have my portfolio equally balanced between real estate and the stock market. This provides for a simple way to rebalance. The real estate holdings generate cash flow and I let my allocation determine where the new dollars get deployed. For example, if the stock market drops 20%, new cash would get deployed into index funds. On the other hand, if the stock market were to grow 25% in 2019 (unlikely! ), I’d look for new real estate investments to deploy money to. With stocks/funds at 45.4% and real estate at 52.2%, I’m pretty close to equilibrium now. We already made one big move in 2019 and may pull off a couple of others. Investing in/growing a business: Mrs. 1500 and I bought a coworking business. We’ll be working on growing the space this year. Some have asked why I still take on these projects. Why trouble yourself with a business or a house flip if you’ve already won the race? I don’t need more money. Growing the business will not only be a fun challenge, but will also be a way to improve my community. Regarding the home flip, I enjoy construction. Coming up with a design and then implementing it with your own hands is incredibly rewarding. It doesn’t hurt that live-in flips can be incredibly lucrative.